If you carry a credit card that features bonus categories that rotate quarterly, now is the time to sign up to earn your bonuses for July-August. Here’s what’s going on with the three most popular credit cards with bonus categories. If you’re a business traveler staying in Hilton hotels or if you rent cars for business travel, the Citi Dividend Card just got a whole lot sweeter this summer. 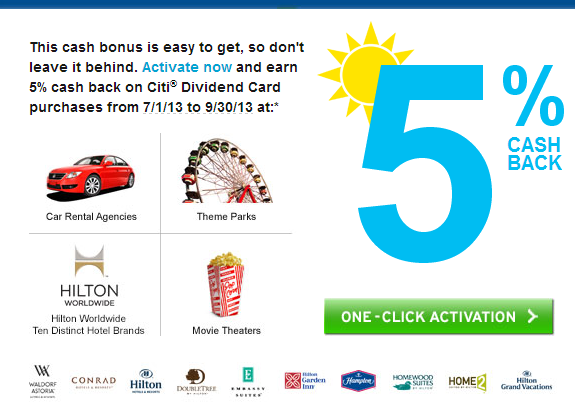 Additional quarterly cash back categories include movie theaters and theme parks. Note that the maximum cash back you can receive in a calendar year is $300. How to activate: If you are a card holder, you should be receiving an email with a link to activate your cash back. 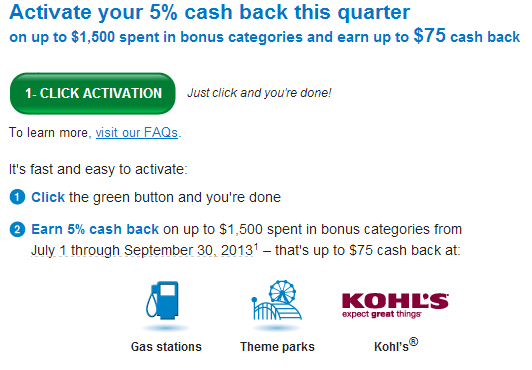 This quarter, 5% back at gas stations is the real gem of the bonus cash back categories. Kohl’s and theme parks don’t excite me too much. If you are a Chase Freedom card holder, you will receive an email with a link to activate your cash back. You can earn up to $75 cash back on your bonus categories during the quarter. Now’s also the time to activate your cash back categories if you carry the US Bank Cash+ credit card. To activate your bonus categories, visit http://cashplus.usbank.com/ The US Bank Cash+ card changes this quarter; you can only earn 5% back on your first $2,000 spent in the bonus categories. Those are the only cards that I currently hold, but if there are others that I missed, let me know in the comments and I will either update this post or create a new post. Discover also has 5% back on gas this quarter.